Levon A. Ter-Petrossian (Լեւոն Տեր-Պետրոսյան, born January 9 1945 in Aleppo, Syria) was the President of Armenia from 1991 to 1998. His country defeated Azerbaijan in a costly war over Nagorno-Karabakh, a predominately ethnically Armenian territory that had been given to Azerbaijan by the Soviet Union. However, because of many economic and political problems, he resigned on February 3, 1998 and was succeeded by Robert Kocharian. Levon Ter-Petrossian born in Syria. He emigrated to Armenia in 1946. In 1968, Ter-Petrossian graduated from the Oriental Studies Department of the Yerevan State University. In 1971, he completed his postgraduate studies at the Leningrad Oriental Studies Institute. In 1972, he completed his masters thesis. In 1987, he received his doctoral degree. In 1972-1978, Ter-Petrossian worked as junior researcher at the Literature Institute of Armenia named after Manouk Abeghian. In 1978-1985, he held the post of science secretary at Matenadaran named after Saint Mesrob Mashdots. Since 1985, Ter-Petrossian has been working at Matenadaran as a senior researcher. He is the author of more than 70 scientific publications in Armenian, Russian and French. He is also a member of the Armenian Writers' Union, the French Asian Society, the Venice Mkhitarian Academy and an Honorary Doctor of La Verne University. Ter-Petrossian's political career started in the 1960s. In February 1988, he led Matenadaran's "Karabakh" committee. In May of the same year, he became involved with the Armenian Committee of the Karabakh movement. From December 10, 1988, to May 31, 1989, he was under arrest together with other members of the "Karabakh" committee. In 1989, Ter-Petrossian was elected Member of the Board of the Armenian National Movement. Later on, he became the Chairman of the Board. On August 27, 1989, he was elected as deputy of the Supreme Soviet of the Armenian SSR. He was re-elected as deputy on May 20, 1990. On August 4 of the same year, he became Chairman of the Supreme Soviet of the Republic of Armenia. Ter-Petrosyan was elected the first President of the newly-independent Republic of Armenia on October 16, 1991 and re-elected on September 22, 1996. His popularity waned during his rule, as he sold Armenian electrical capacity to Georgia while limiting electricity’s availability to Armenia to four hours per day in order to fund the war against Azerbaijan — a move regarded as necessary by the Armenian Army. He was also unpopular with many because he banned the nation's leading opposition party, the Armenian Revolutionary Federation (ARF- Revolutionary Federation-Dashnaktsutiune), jailed its leadership, and shut down Yerkir, the country's largest daily newspaper. He was forced to step down in February 1998 after advocating additional concessions to Azerbaijan in the resolution of the conflict over Nagorno-Karabakh. Ter-Petrossian's key ministers, led by then-Prime Minister Robert Kocharian, refused to accept a peace plan for Karabakh put forward by international mediators in September 1997. The plan, accepted by Ter-Petrossian and Azerbaijan, called for a "phased" settlement of the conflict which would postpone an agreement on Karabakh's status, the main stumbling block. That agreement was to accompany the return of most Armenian-controlled Azerbaijani territories around Karabakh and the lifting of the Azerbaijani and Turkish blockades of Armenia. Since his resignation, Ter-Petrossian has rarely appeared in public and has studiously avoided contact with the media, although there was speculation that he would run for president of Armenia in the last general election in February 2003. Ter-Petrossian was the first president of post-Soviet Armenia, and inherited a landlocked country that was blockaded to the east and west, had weak links as yet to the south, and systematic corruption. Despite this, he was taking on a country in high spirits, and people expected and were ready for a great change. Most of the changes they expected never came, and massive emigration ensued. He was president of independent Armenia for 6 years, and these are the major criticisms of his term in office. Corruption not only continued to be tolerated at a time when people were demanding and expecting a change, a large network of privately held, government affiliated businessmen sprung up, the "oligarchs" who until today control the Armenian economy. Ter-Petrossian chose never to bring up the genocide and reparations issues up with an already belligerent Turkey. He fired his foreign minister Raffi Hovannisian for mentioning the genocide in Istanbul. Ter-Petrosyan banned one of the most popular political organizations in the Diaspora, which had reestablished itself in Armenia and had a loyal following, especially after the Karabakh war. Dual citizenship was specifically banned constitutionally. This was seen as an effort to keep himself more firmly in power. Despite being a "man of the people" before his first election, making speeches at Karabakh protests, addressing rallies, and talking to the press before becoming president, after his election Ter-Petrossian went into virtual seclusion from the people, and completely cut himself off from them. In 1996 presidential elections, observers agree the elections and their outcome were falsified. Vazgen Manoukyan, who most likely won the 1996 presidential election, led the ensuing protests when the fraud was obvious. The protests were put down with violence, tanks and martial law. The final criticism, the one that caused him to leave the presidency, was his willingness to make concessions to Azerbaijan on the status of Karabakh, which would have sacrificed it's ambitions for independence. In 2008 Ter-Petrossian once again ran for president and lost. Somehow during the campaign, he regained his ability to speak to crowds of Armenians outdoors, which he did constantly. He also somehow managed to find his sense of right and wrong, and seemed unhappy that the election was not free and that he lost, and he led protests afterwards over the results. During the campaign, he announced that he was going to address his shortcomings from his presidency, and apologize for his mistakes. His much anticipated speech was simply an apology for promoting the men from Karabakh to power who eventually forced him to resign when his Karabakh concessions became known to them. That was all. Within a splintered opposition, a few others dropped out and endorsed Ter-Petrossian, and he even received a somewhat surprising endorsement from the Foreign Minister he had fired. 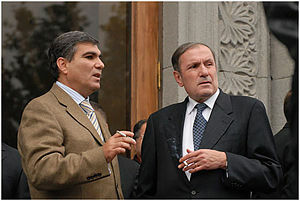 He was enraged that he did not receive Artur Baghdasaryan, his biggest opposition competitors endorsement, calling him a traitor to Armenia for not stepping out of the race, but did not demand, or seem surprised that Vazgen Manoukyan, who Ter-Petrossian had stolen the election from in 1996 did not endorse him. This page was last edited on 25 February 2019, at 12:34.